The Refined Geek » Lyne: Connect All The Things. Lyne: Connect All The Things. I was never really a big fan of doing books of puzzles, like crosswords or sudoku. I understand the attraction to some degree, once you’ve got a modicum of skill in doing them such puzzles can be relaxing as you don’t really think about much else while you’re doing them. Since I’m primarily an escapist when it comes games the idea of doing puzzle only games like Lyne didn’t really appeal to me at first but after playing for a couple hours it became more of an optimization problem, one which had a very simple set of rules that could create rather complicated problems. 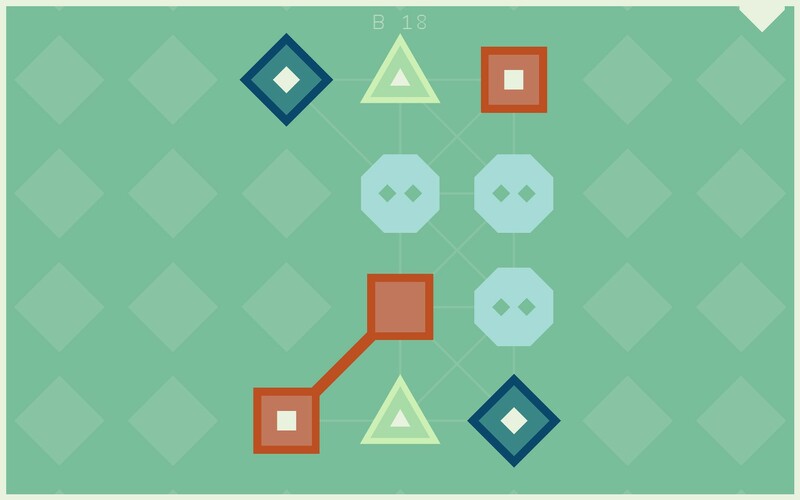 The basic premise of Lyne is simple, there’s a bunch of different coloured shapes and all you need to do is connect them all together. 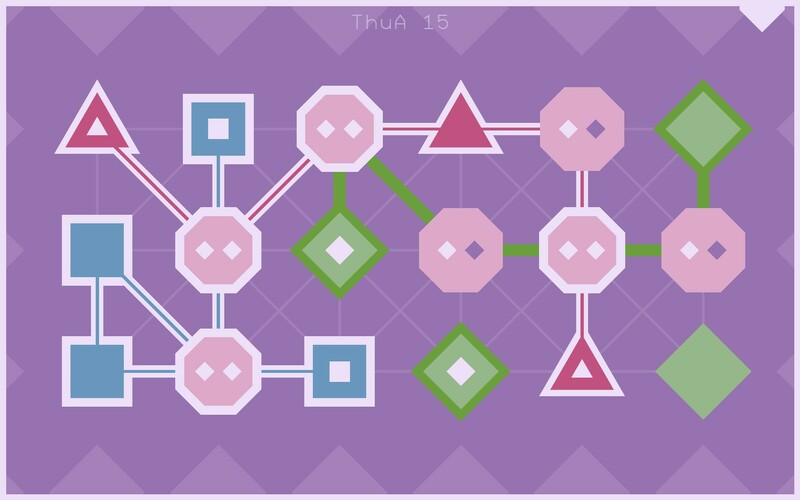 All of the shapes of one colour must be connected together so you can’t be tricky and skip certain blocks to make your life easier. Additionally every path can only be crossed once which means that the path you take for one colour will determine what paths are left available for the remaining ones. The number of puzzles available in Lyne is rather staggering, on the order of 600 or more by my guess, which should be enough to keep even the most intrepid puzzle solver busy for a while. Lyne is incredibly simplistic in its aesthetic, using solid colours and distinct shapes for everything. At first I thought the unlocking of additional colour palettes was a bit of a gimmicky way of getting you to play for longer but they actually function really well as a visual break. Since the style is so basic everything starts to blend into each other after a while so changing up the colours helps to stop that from happening. The pallette unlocks seem to be spaced out evenly enough so that you’ll get a new one before you get bored of your current one which, I admit, did make me play for longer than I’d first anticipated. The puzzle sets are well thought out, starting out easy in order to introduce the concept for that set and then ramping up the difficulty as you make your way through each of the puzzles. For me personally the most challenging ones always seemed to be somewhere in the middle of the set, usually because I was missing some trick that would enable me to progress through it. Indeed the more puzzles you do the more patterns you’ll recognise , something which can both simplify and complicate a puzzle for you. For me some basic rules like finding out which paths must go somewhere and dividing the board up by colour helped to get me past some of the trickier puzzles although even those could some times leave me in a tizzy. The daily puzzles were an interesting aside from the regular sets as, from what I could tell, they are generated on the day using some kind of algorithm. In fact I think this is how most of the puzzles were likely generated however the sets have been guided somewhat by the developer whilst these sets seem to be far more random, with some of them being incredibly easy whilst the others horrendously complex. Still if you’re the kind of person that likes doing a puzzle daily then this will be a brilliant little feature for you as it’s almost guaranteed that these puzzles will be unique every day. 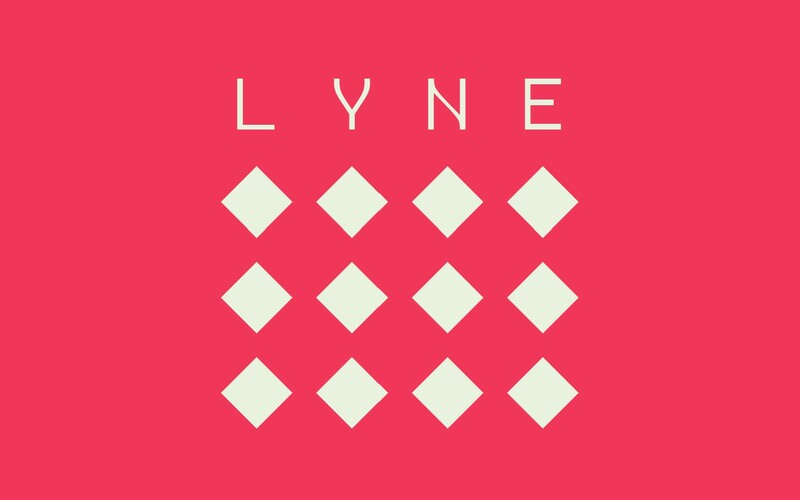 Lyne is an interesting minimalistic puzzle game that looks deceptively simple on first look. The mechanics are simple enough that you can figure it out without instruction but, like many things with simple origins, mastering those rules will prove to be far more challenging. Like all games of this nature though it does tend to become somewhat repetitive after a while however if you’re the kind of person who thrives on technical challenges like this then Lyne will provide endless hours of enjoyment. Lyne is available PC, Windows Phone, Android and iOS right now for $2.99, $2.49, $2.99 and $2.99 respectively. Game was played on the PC with4 hours of total play time and 27% of the achievements unlocked.